Marketing Activities: As with most Tv shows most of their promotion is done offline through their Tv channel. As for X factor their Internet marketing activities is promoted on their actual show when it is viewed on channel 7 and they are also viewed quite frequently from News sites under entertainment. Domain Name: To view X Factor’s online activities the domain name is: Au.tv.yahoo.com/x-factor/#page1, which is different to what one might consider it to be under. For users that don’t use the page often, and have no recollection of the offline promotion, it is to some degree difficult to locate where their content is located as the website is under yahoo7. Content: X Factor online offers users a number of activities on their webpage and its quite interactive. 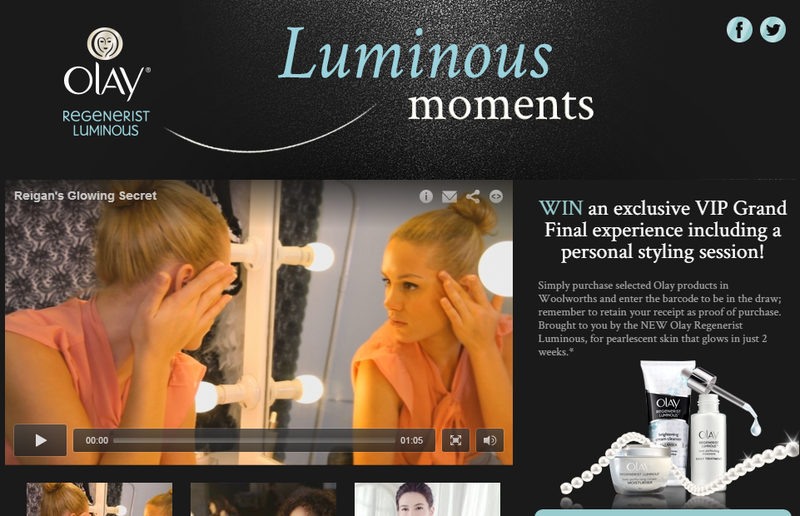 The content has a nice balance of text and images/audio, which makes the website look very appealing. Some of this content includes: catching up on episodes, being able to vote online, there’s a section dedicated to the judges where users can watch clips etc, users can view X factor news, listen to music and radio, have access to view what happens backstage, participate in Fan Factor and go in the draw to win prizes. Connections: X Factor online has a number of connections including their social medias: Facebook, Twitter, Instagram and Tumblr. Gives the audience a clear con-nection to their social media platforms. X Factor also has a connection with iTunes, which is being complimented by their new app. Olay and McDonalds is also being cross promoted, another form of connection. Community: The community is really positive and interactive. A lot of people will tweet in during the show. There is quite a large fan base for the show online. Viewers often interact with each other and not so much between X Factor and the viewer though the content is uploaded frequently. Communication: X Factor is communicated through a number of social media platforms such as Facebook, Twitter, Instagram, Tumblr and Google+. There is a large opportunity for their audience to participate in and interact with through these avenues. Fan factor is another form of communication that allows viewers to interact with the show. The social media consists of posts from X Factor and mainly viewer to viewer interaction. 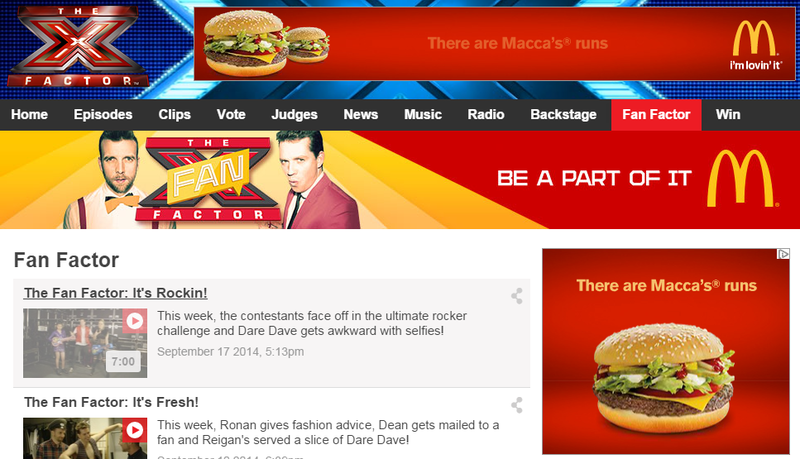 Cross Promotion: By clicking under the Fan Factor tab, McDonalds is being cross promoted and Olay can be found in the win section ‘Get the X Factor Treatment’, which is another cross promotion. X Factor has provided Olay with a great opportunity for promotion as on the show the contestants get makeovers before they go onto the live stage. So by promoting Olay as a means of makeover worthy products, x factor is really doing them a favour. However it works in X factors favour also because it drives more traffic to their webpage. Marketing Activities: The block is much the same as X Factor in regards to their marketing activities. The website is being promoted offline on the actual show and its more an extended interaction platform to their show on channel 9, which is also the purpose of The Block’s Internet presence. Domain Name: When searching for The Block I found it really difficult to view their online content. But nonetheless The Block can be found at: www.jump-in.com.au/show/theblock/glasshouse, which is understandable considering that no where in the domain name is any relation to channel 9. X Factor was much easier but still had a degree of difficulty finding the page with ease. 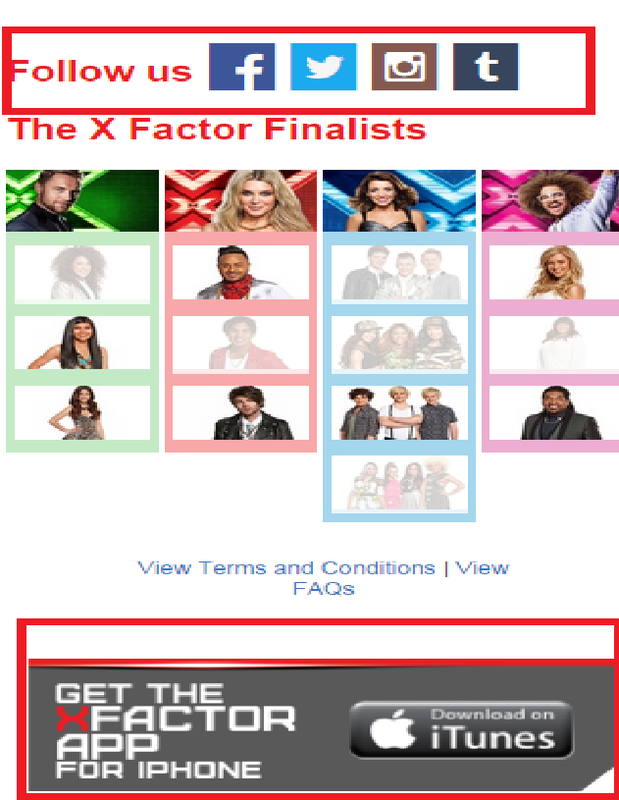 Content: X Factor has a lot more content to view on their page however The Block covers everything necessary for an Internet presence being able to view the recent rooms created by contestants, access to the latest clips, 360 room tours which I think is a nice feature opposed to looking at perfected pictures, access to the suppliers of all the items used and again the ability to win prizes. As far as content their covering their bases with a few extra features both having something interesting for consumers to engage in. 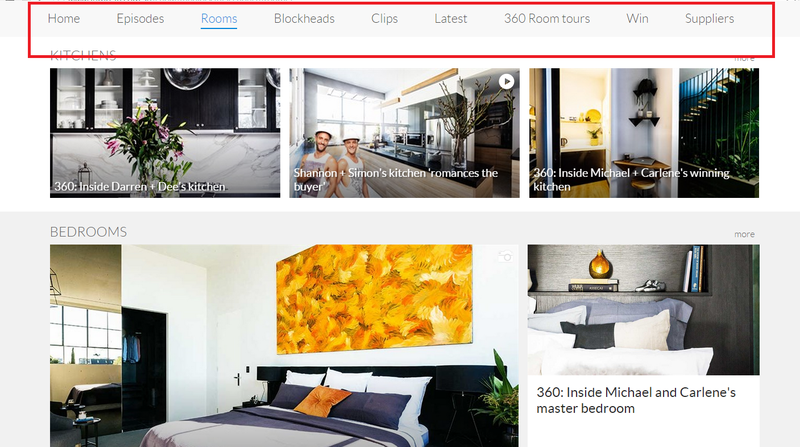 Connections: The Block favourably for their viewers lists all the suppliers of the products that are being used throughout the show so that their viewers can recreate the rooms created on the show and these are considered connections that favour their audience. The Block is also connected with Twitter and Facebook and promotes their social media on their page which is beneficial for communication. Realestate.com is another compliment to their connections being advertised on their homepage for houses to rent, which may be relevant for inspired viewers wanting to upgrade. Community: The community is based through Facebook and Twitter, with good interaction and positivity. Same as X Factor and I think this is because these shows offer such enjoyable content and are covering areas of entertainment that are truly entertaining. Communication: Communication as mentioned above is predominately Facebook and Twitter, which offers viewers favourable opportunities to interact with The Block. It works best when viewers Tweet into the show and the Tweets are previewed on the show. Their content is updated quite frequently, however there doesn’t seen to be much commenting on viewers comments but rather viewer to viewer. Cross Promotion: Realestate.com.au can be found on their website advertising homes. Which is relevant to the show and would interest potential customers so I think its a necessary cross promotion. Unlike X Factor The Block only had the one cross promotion opposed to the two found on X Factor. Marketing Activities: Big Brother isn’t necessarily promoting their content on News sites but because the show is quite controversial Big Brother does pick up some viewers through these their headlines so I thought it would be necessary to mention. The Block and X Factor would get the same articles however, Big Brother’s articles are again controversial so the non viewer will engage in the content even though they’re not watching the show opposed to the other shows which wouldn’t generate this type of viewer. Big Brother like the other shows is also being promoted offline on their actual show howe ver, Big Brother has almost been promoting across their social medias including Facebook, Twitter and Youtube with Tim Dormer and x-contestent being one of those promoters. Domain Name: Again just like The Block the Big Brother Internet page was quite difficult to find under: www.jump-in.com.au/show/bigbrother/2014. It seems Yahoo7 has more of a presence in search engines compared to the shows on Channel 9. Content: Content is all about the housemates including: What’s Hot, latest episodes and housemates under the radar. The site covers all the necessary features and something interactive: Your power, which lets users have a degree of control over the game by being able to vote on various things just like X Factor and The Block. Big Brother’s page doesn’t have as much as far as their content available but nonetheless covers their bases. Connections: Unlike X Factor and The Block, Big Brother has their sponsors listed at the bottom of their website, providing well recognition and visibility, which benefits Big Brother because viewers can be reminded of whose supporting their show. Big Brother is also connecting with Twitter and Facebook as their communication means. Community: Because Big Brother is quite controversial there is actually a lot of negativity throughout their social media presence. And I think it’s because a lot of people do not like what the show is offering as different personalities in the house can be off-putting for people. The people make the show, and if the viewers don’t enjoy the people the show isn’t enjoyable. It has also been known for its poor engagement over the years, which adds to the overall liveability of the show . So its a common theme throughout their audience. Communication: Big Brother communicates often through the use of Twitter and Facebook while the show is being watched offline, which is similar to the presence of the other shows. Cross Promotion: There wasn’t really any cross promotion on their page. Perhaps this could be utilised to gauge more viewers as compared to the other two TV shows. Big Brother (2014), viewed 18 September 2014, http://www.jump-in.com.au/show/bigbrother/2014/. X Factor (2014), viewed 18 September 2014, https://au.tv.yahoo.com/x-factor/. The Block (2014), viewed 18 September 2014, http://www.jump-in.com.au/show/theblock/glasshouse/. This entry was posted in Business, Internet Marketing, Marketing and tagged Big Brother, Community, Connection, Content, Cross Promotion, Domain Name, Marketing Activities, The Block, X Factor on September 21, 2014 by crinkleccut2. nice blog mate I really enjoy your theme! Hi Troy, first of all, definitely loving the layout, it is so easy to just read through everything without scrolling down and down and down again. Content wise, very informational and easy to understand with the specifics screenshot given. Overall, great job! This blog post is really well done! I like the use of the two columns. I agree with you on cross promotion that Big Brother should use more cross promotion to draw more of an audience. Yeah well they do have I guess a natural audience anyway, but if they perhaps cross promoted something it may draw more traffic to their website.